Smaller size fish oil softgel, natural lemon flavor. (SCD Legal) Mini Omega-3 ™ contains the same premium fish oil concentrate as our Omega Max ™ softgels, but the capsules are half the size. This smaller softgel is often preferred by children and other individuals who have difficulty swallowing larger pills. Natural lemon flavor has been added to the oil, giving this product a light, citrus taste. Antioxidant blend with vitamin E tocopherols maintains freshness. Each batch is analyzed by an independent, third-party laboratory to verify oil purity and omega-3 potency. Cholesterol-free. Suggested Use: 1 to 6 softgels daily with food. 1.What are some of the health benefits of Mini Omega-3? 2. How many softgels should I take per day? Recommended dose is 1 to 6 softgels per day or as recommended by your health care practitioner. 3. Should I take it with food? Yes as this enhances absorption into your system. 4. Can I mix Mini Omega-3 with liquids? Yes Mini Omega-3 can be mixed with liquids, but it is recommended that you not use hot liquids. 5. Do the softgels have any taste to it ? Yes, a lemon flavor is added to Mini Omega-3 to give it a citrus taste. 6. Do I have to take all the softgels at one time? No you can split doses throughout your day. 7. 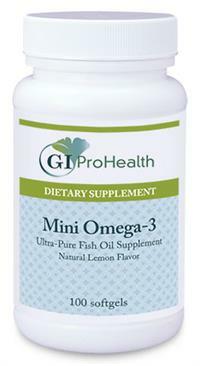 What is the amount of EPA in Mini Omega-3? Mini Omega-3 has 180* mgs per softgel. 8. What is the amount of DHA in Mini Omega-3? 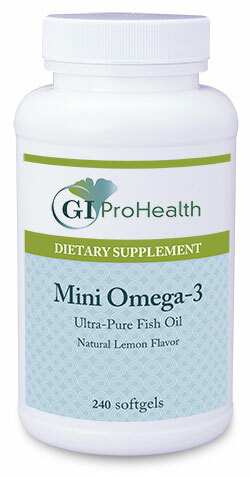 Mini Omega-3 has 130* mgs per softgel. 9. Can I take less of Mini Omega-3 than other brands? Yes because Mini Omega-3 has such a high EPA and DHA content you can take up to 50% less than some other brands. This also makes Mini Omega-3 a good value. 10. Is Mini Omega-3 for children only? Mini Omega-3 can be taken by adults also, but we do have Omega Max™ which has twice the EPA and DHA as the smaller soft gelsbut the softgel is half the size for anyone who has problems with swallowing the larger softgels. Two of the mini gels equal the same amount of EPA and DHA as an Omega Max™ softgel. 11. What size does Mini Omega-3 come in? Have any questions not answered here? Feel free to e mail us at info@giprohealth.com. Note: when making phone purchases please be sure to speak slowly and include all credit card information and full address also please leave an e mail address if possible for notifications of delivery. GI ProHealth does NOT sell or share any customer information for any reason what so ever. © 2019 GI ProHealth Inc.